The Professional Regulation Commission (PRC) announced on Wednesday, July 2, 2014 the list of passers for June 2014 Social Worker board exam. 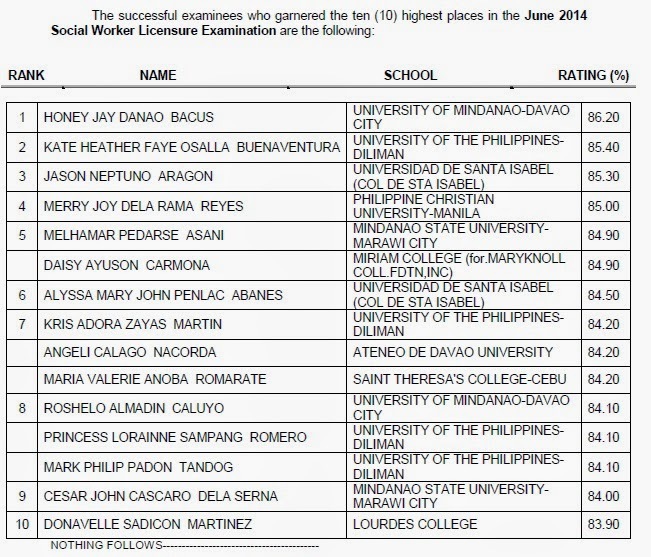 Honey Jay Danao Bacus of University of Mindanao-Davao City topped the board with 86.20 percent grade. A University of the Philippines Diliman (UPD) graduate Kate Heather Faye Osalla Buenaventura ranked second with 85.40 percent grade.